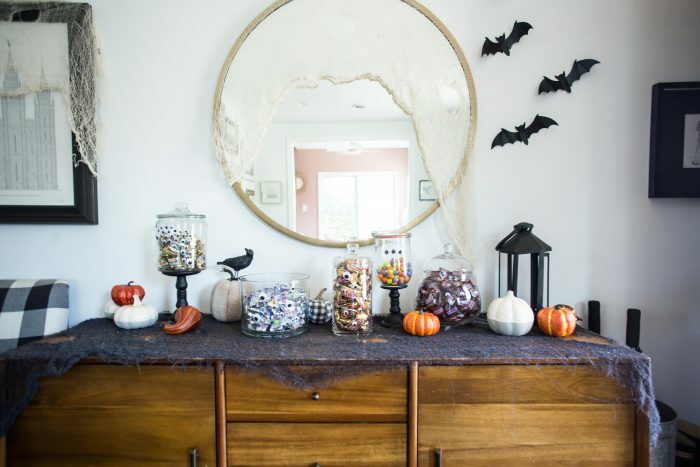 Halloween is just around the corner, and I am so excited to pre-game with this really simple, cute, and perfect Halloween Candy Buffet for my entry table. 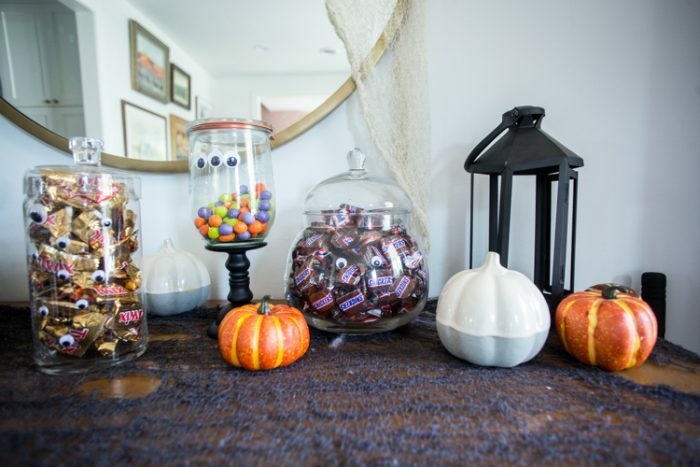 With the kids coming and going, as well as the neighborhood friends, it is fun to use some of our favorite Mars Mini Halloween Candy as decor. 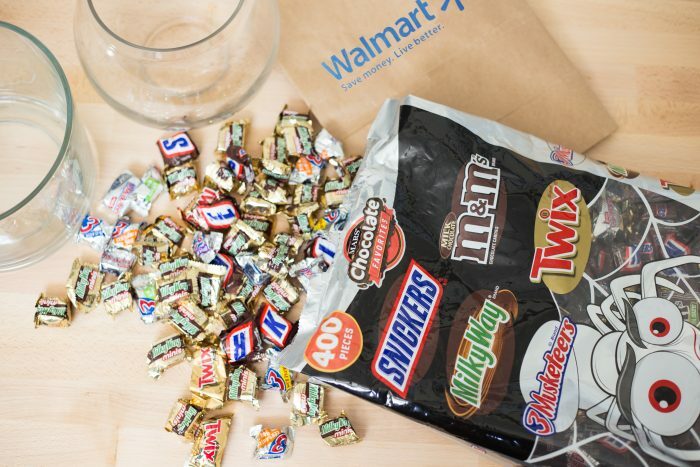 Because what is more Halloween than your favorite candy? 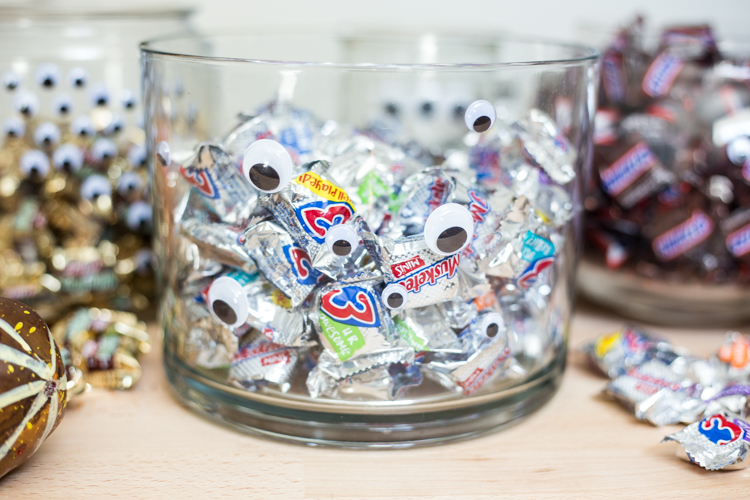 While you could make a Halloween Candy Buffet with just an assortment of glass jars and containers, I decided to dress these up a little bit by adding some simple googly eyes to make the jars look like monsters. Monsters filled with candy are my favorite kind. This DIY is super easy, which is just my speed when I am working on Halloween costumes and homework and making sure everyone is fed and the laundry is done, too. The simpler and sweeter, the better. I found all of my supplies at my local Walmart while I was picking up other groceries. They already have all of our favorite Halloween candy out and ready for the grabbing. I especially like these super mini candy bar assortments that allow us to grab a perfectly small bite as we walk by. Hold onto your hats for this one, folks. 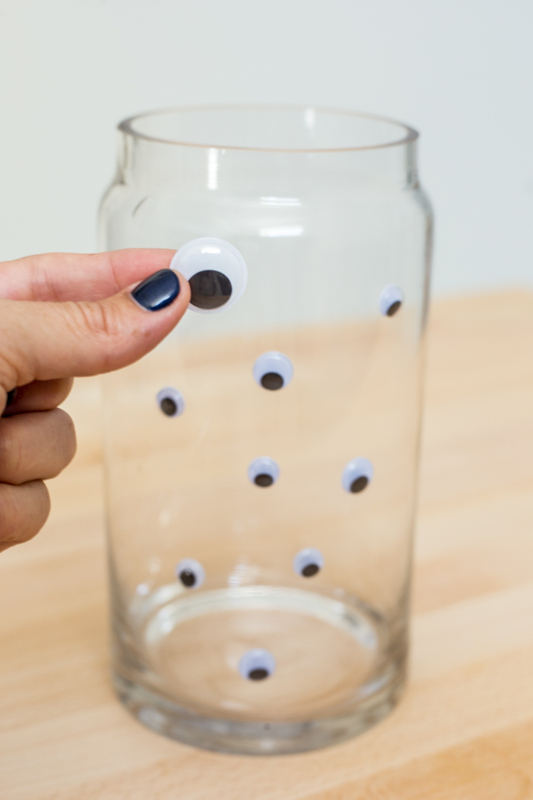 Stick a googly eye onto a glue dot, pull both the eye and the sticky dot off of the paper, then stick it onto the jar! 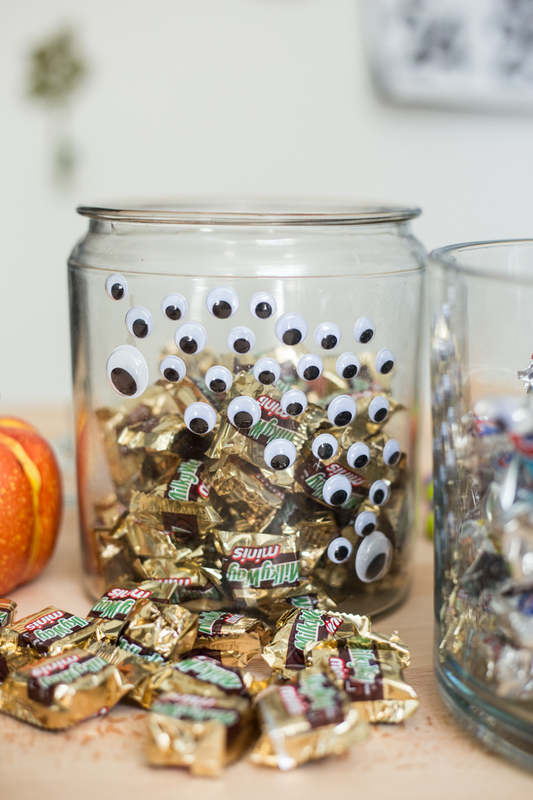 Keep glueing and sticking until you have as many monster eyes as you want on each of your containers for the perfect, simple Halloween themed candy buffet. I liked having some variety. Some of my jars have a bunch of eyes all over, some have less so they look less scary and more silly. 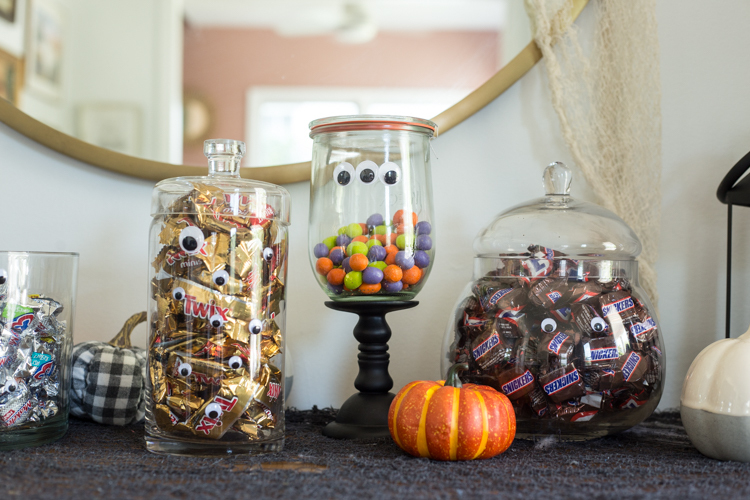 I definitely lean more cute for Halloween decor, so these simple googly eye monster jars are right up my alley. 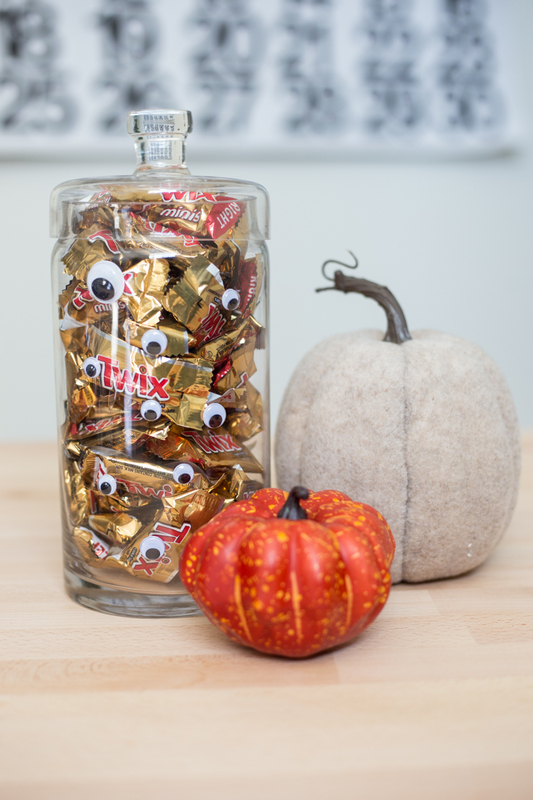 Once your jars are decorated with eyes, divide your Halloween candy by type. This makes it easier for people to grab the candy that they prefer each time they need a little piece. SNICKERS® are my personal favorite and they were also my Dad’s candy tax growing up, so I rarely ate them! Peanut M&M’s® and MILKY WAY® come tied in second. TWIX® are what my kids always reach for, and we all love 3 MUSKETEERS®. I like to add some mini pumpkins and gourds to the Halloween candy buffet to increase the festivity and make it transition well from fall decor into true Halloween season. 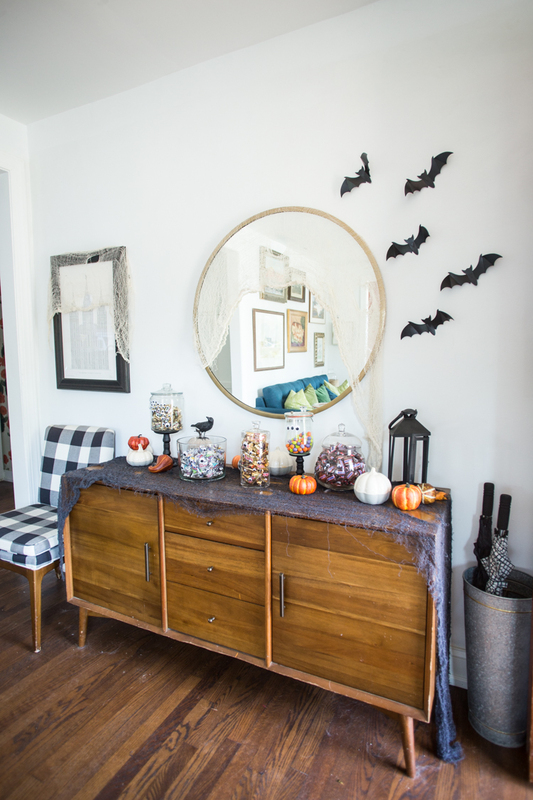 Once you’ve got your buffet all set up, you can share bites of Halloween candy with visitors all season long. My kids know they can have a treat after they’ve finished their homework, and the jars with lids ensure the candy supplies aren’t depleted too quickly. 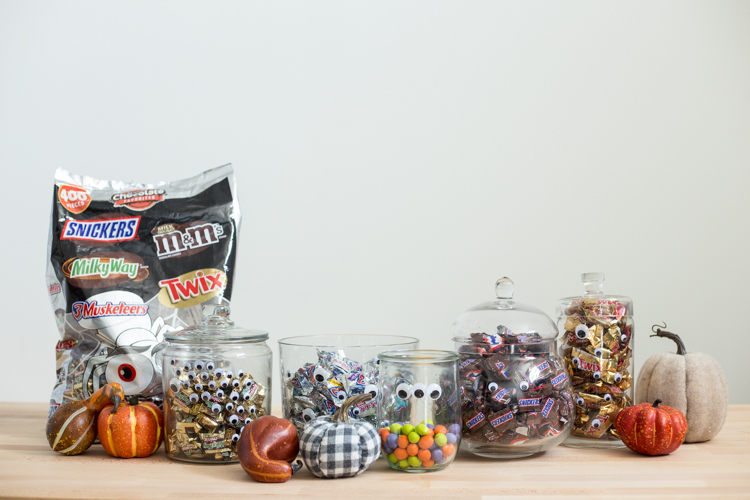 Beyond seasonal decor, this easy Monster Jars Halloween Candy Buffet would be super fun for a Halloween party, October wedding, or even to set up on your front porch for trick-or-treaters!